Does anyone else have comfort food? I know we all eat comfort food to make ourselves feel better (or try to, anyway) but does anyone else have a meal or a snack they turn to, that makes them feel better? I have two which I turn to in a bid to make myself feel better, and both are equally disgusting or delicious, depending on who you are, and whether you are a gluten free/vegan/plant based diet/thin person. My go-to comfort foods are heavy in the carb department – as all good comfort foods are. 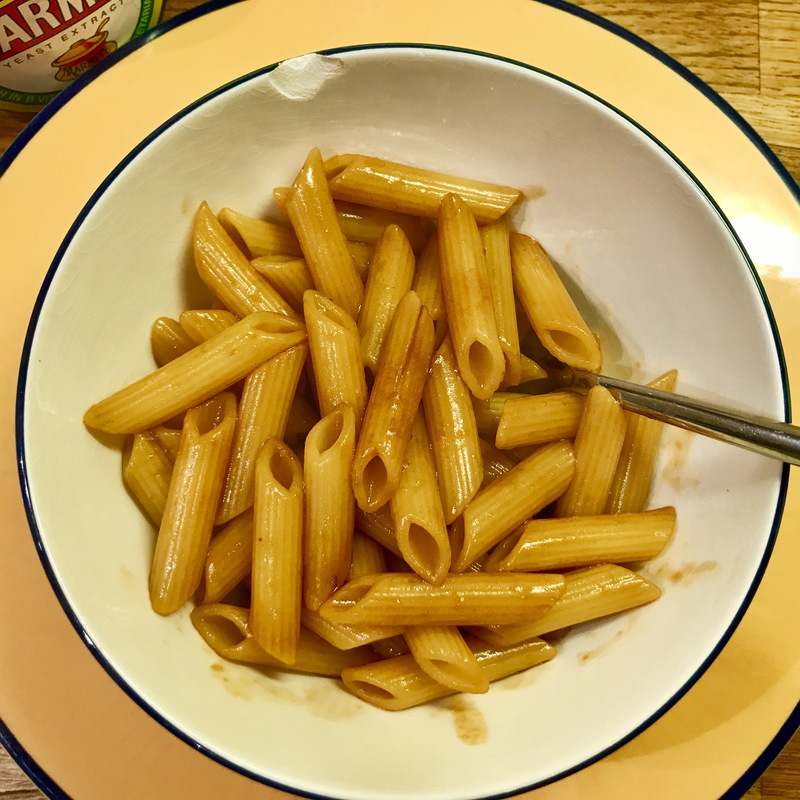 My first comfort food is Marmite pasta; and you’ll either love it or you’ll hate it. There’s something about this beige/brown bowlful of food which is incredibly comforting. I don’t know if it’s the simplicity of it, or whether it’s because I link Marmite with childhood, and allowing those Marmitey childhood feelings to resurface makes me feel better. But once I’ve eaten it, feel better I certainly do. Funnily enough, having it in the chipped bowl makes me feet better too. I feel like the chipped bowl gets me, it knows me. If you’re interested, all you do is cook yourself a portion of pasta. Then, over a low heat in a small pan, warm a spoonful of butter and a spoonful of Marmite together and stir to make a sauce. Then pour the salty goodness over your pasta. Tuck in and you will be in heaven, unless you hate Marmite, then in which case, you will be in hell. My second comfort food is a ravioli in tomato sauce, from a tin. This old chestnut gets carted out when we are in dire straits. When all hope is lost, or I am feeling very unwell, the tinned ravioli never fails to make an appearance. I’m sure a lot of you will think tinned ravioli is truly grim, but again, it has positive childhood connotations and memories for me. I had tinned ravioli for lunch today. I drove past Sainsbury’s on my way back from work and all of a sudden, I needed it. But I’ve gone from using ravioli to make my tummy ache better or my sore throat better, to using it to make my head better, or my mind better. Is that a good thing? Is that a bad thing? I’m not quite sure, I’m not sure if it matters either. 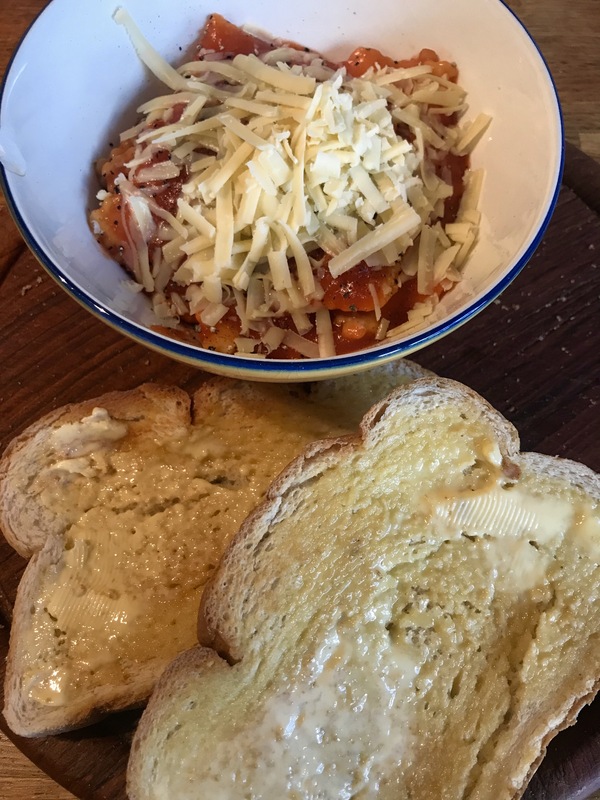 There’s something about eating ravioli from a tin, wearing your jim-jams, sitting in your bed, snuggled up in your blankets that gives me a feeling of safety, and safety is akin to comfort, right? Now I’m thinking about it, I don’t know if these are comfort foods, or more foods that I use to tell people I’m either feeling unhappy, or I’m feeling ill. The second I get the ravioli out my dad goes “that’s when I know you aren’t feeling well”. So, maybe I use these things to signal to those who know me best, that I’m not alright, and I probably need a bit of help. Sometimes I guess I don’t even need help, but I just need someone to ask, “are you okay?”, or “what’s up”. Having someone recognise that you aren’t alright, and to make themselves available for you to not be alright and have a little cry, is what we want really, isn’t it? These things don’t really make you feel better, but they make you think you feel better. Kind of like a placebo effect, but instead of taking sugar pills, you are eating pasta out of tins. They are creating a reaction inside your brain, and your brain is tricking you into making you feel better or happier for a moment. I’d imagine all of these comfort foods are attached to a nice memory or a nice time in our lives. As long as they work for you, that’s the main point. So, what is your comfort food? I’d love to know. Does anyone else have a place where they go to chill? Or go for inspiration? Or just one of those special places that you go to think? I have a few of them and one of them happens to be my windowsill (don’t worry, I promise I won’t fall off). It’s good to have somewhere where people don’t bother you and where you feel completely chill. Yeah, I get a few weird looks from passersby in the street and a few people in cars have stopped to stare at me, but I like it up there. It gets the sun and it’s leafy and green nearby, and I like being up higher than everyone else and seeing them when they can’t see me. But, anyway, it’s my chill sill. I had a bad day today. Something happened before lunchtime and I ended up spending my lunch hour at home sobbing into my pillow with my kitty cat and my jim jams on – sad huh? Not really, just normal I think. It wasn’t really that bad, but it had just come out of the blue and got to me ya know? Taken me by surprise and the unexpectedness of it had brought on the tears, no one wants to the girl that cries at work either, so slid on out to the car and snuck off home for a bit. I think I just needed a few minutes to be upset about it and then some time to talk about it. It was at this point without everyone else’s opinions blurring my vision that I realised it wasn’t exactly as I thought it was. The awful thing that had happened wasn’t as awful as I thought it was and it was actually probably quite a nice thing in disguise. But someone had told me it was awful and I automatically assumed that they were right about it. It goes to show how easily innfluenced I can be, and we as a general human race. Someone says something and we just assume that what they are saying is right without any further thought. So here’s a thought, that person that tells you things are bad or good and offers opinions and advice all the time – they might be wrong. Because at the end of the day you know you better than anyone else does. You know how you feel about things and you know the situations you are in and they don’t, not really. So next time someone tells you something is wrong or right, bad or good, think for a moment and consider whether that is the way YOU feel about it. Because what is important is how you feel about things, not how others feel about things. Please don’t pretend to feel one way about something purely because it’s the way you are ‘meant’ to feel, feel what you feel. Because feelings aren’t right or wrong, they are just that, feelings. So do me a favour – make sure you are feeling how you are feeling, not how anyone else is feeling.